You will love this overnight oatmeal recipe with steel cut oats and it’s just so easy, healthy and comforting. We make this at least a few times a month at our house. It’s perfect for those busy weekday mornings or lazy weekend mornings. This recipe calls for just a few ingredients and then you can top it with lots of fun and yummy toppings. The best part is that you don’t need a crockpot to make this! I first tried steel cut oatmeal while we were on a Disney trip. In the mornings before the parks, my husband would run to get coffee and muffins for our breakfast and he would bring them back for all of us to eat in our hotel room before heading out for the day. I am always looking for healthier eating options and one time, he brought me back steel cut oatmeal with lots of tiny containers of fruits and nuts that he got at a local coffee shop. It was delicious and I was more than happy to skip the muffins and pastries that the kids were eating that day. I came home after vacation and I looked for an easy way to make steel cut oatmeal myself. If you cook them from scratch in the morning, it can take 30 minutes, not to mention prep time. I also read about and tried some of the Food Network overnight oatmeal crockpot and other crockpot recipes and they came out soupy, burnt and were total failures. So, I kept looking for other recipes as I was determined to find a quick and easy way to make these wonderful, nutty oats. I found an old Food and Wine Magazine overnight oatmeal recipe and made several changes to suit my taste. I love the taste of cinnamon and vanilla in my cereal and a touch of salt balances it nicely. I also prefer to add my fruits and nuts in the morning so the fruits are fresh and the nuts are crunchy. The preparation time for this recipe is just about 5 minutes at night, before you go to bed. You just toss in all of the ingredients and bring it to a boil for a minute or so. Then, I turn the stove completely off and put the lid on. In the morning, it all plumps up and you just have to cook and warm the oatmeal for about 10-12 minutes to finish it off. So easy! My parents come to visit quite a bit and they love to eat healthy. Since this recipe makes enough for 6-8 servings (depending on your portions), I whip it up as our Saturday breakfast and put out a nice toppings bar with brown sugar, toasted slivered walnuts, raisins and sometimes bananas or blueberries. My kids love to add their own toppings. If you are having this oatmeal during the week or if you can’t eat it all, it can be stored in the fridge for up to a week and you can reheat it as you need it. Steel cut oats can be found either in the cereal section of your grocery store or often you can find them in the bulk section. My local grocery store sells dry steel cut oats for just $1.15/lb. in their bulk grains department. Note that these oats aren’t your typical flat, pressed oats. They are more round and have a nice nutty flavor. To keep this recipe for later, scroll over any photo and press the “pin it” to pin it to your Pinterest or scroll to the bottom of the page and press the “pin it” button. Place all of the ingredients in a medium pot. Bring to a full boil and boil for 1-2 minutes. 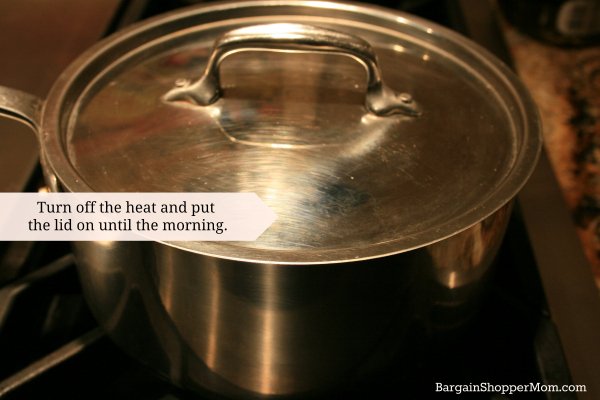 Turn your stove off and place the lid on the pot until morning. Remove the lid and cook bring the oats back to a boil on high heat, reduce the heat and simmer for 10 minutes. Serve with any toppings that you would like. If you have leftovers, you can store them in an airtight container (thin them with water if needed) and reheat them in the microwave. My kids love adding their own toppings in the morning. If we have guests, I put out a toppings bar with brown sugar, toasted almond slivers, raisins, bananas or any other fruit you might have. The crunchy nuts, raisins and fresh fruits tastes great in the warm steel cut oatmeal. Be sure to check out more great recipes in our recipes section! Any toppings you would like brown sugar, toasted nuts, bananas, blueberries, cranberries, etc. Check out more easy recipes! Good Morning Heidi…so glad to see this recipe. I’ve already pinned it. I love steel cut oats and have had the same crockpot issues as you have, so this sounds like the perfect solution. We also have our ‘oatmeal fixings’ basket so that everyone can make their oatmeal as they like. I’m excited to try this out. I love steel cut oats, but never have time to make them, and the crock pot method always ends up over done. Thanks! You are welcome! This is one of our favorite healthy breakfasts. Can the recipe be doubled and cook dinner larger pot? I have never tried it, but I’m sure it can. The basic recipe serves about 6 people. I would say it serves about 5-6 people with a moderate cereal bowl full. I serve my husband, myself and three kids and there are leftovers.